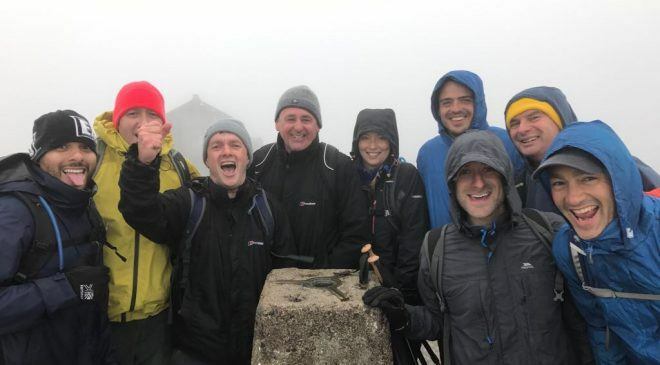 A team of nine surveyors from retail property firm, GCW raised a fantastic £17,500 for Elifar taking on the Three Peaks Challenge, trekking the highest mountains in Scotland, England and Wales. The climbs took the team to the peak of Ben Nevis at 1,345m, Scafell Pike at 978m and Snowdon at 1,085m. Despite freezing cold and driving rain, the team completed the Three Peaks in under 24 hours helped hugely by driver Iain Coxon of BLB Surveyors. Thanks to sponsorship from friends, clients and industry peers they raised a huge sum of money which will directly help Elifar to fund much needed equipment for disabled children and young adults.